The unpleasant feeling of chewing while wearing headphones does little to detract from the immersive, experiential quality of genre-blurring multimedia piece Gastronomic. Instead, it lends an appropriate sensation of eating at altitude to a show set largely in an aeroplane galley. 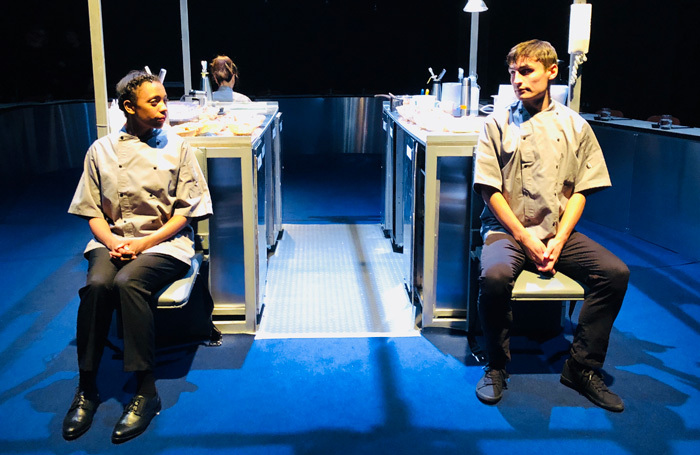 Developed by boundary-pushing Norwich-based theatremakers Curious Directive in collaboration with several prominent local chefs, the show is a lyrical exploration of memory, migration, and molecular gastronomy. Seated around a sushi restaurant conveyor belt, the audience is served bitesize delicacies while witnessing snapshots from the exceedingly simple, but nonetheless evocative story of a refugee pastry chef. Far from feeling gimmicky, the seven-item tasting menu is inspired and surprising, curated and executed with finesse. It’s the kind of food that seems pretentious until you appreciate the forensic precision with which flavours and textures are combined. A tart, transitory cloud of champagne foam dissolves on the tongue. A dense clutch of mushrooms, redolent with woodsmoke and white miso, is served on a picture frame made misty with condensation. Despite the distracting deconstructed fiddly-ness of some dishes, director Jack Lowe handles the shifts between scenes, courses, and audio material with confidence. His three performers take pains to dig into their admittedly thin characters, finding occasional moments of rich resonance. Among them, Janet Etuk is especially strong in dual roles as a conflicted chef and a bored border guard. Though the plot could be meatier, and the technical elements more substantial, the production, like the food, is bold and satisfying.